Home » VectorVest » Reiterate buy Victoria (VCP) says VectorVest. After a stellar year it could be Groundhog Day once again? Reiterate buy Victoria (VCP) says VectorVest. After a stellar year it could be Groundhog Day once again? By Alan Green in VectorVest on 12th September 2017 . Founded in 1895, Kidderminster based Victoria Plc (VCP.L) engages in the design, manufacture, export, and distribution of carpets and carpet yarns. It offers tufted carpets and Wilton woven products for residential and commercial markets. The company also supplies woven Wilton broadloom carpets and carpet tiles for the corporate / commercial sector, as well as Axminster carpets for hotels, casinos, and cruise liners. In addition, it is involved in importing and distributing wool and natural floor coverings. VCP operates in the UK, Australia, Ireland, and Canada. Following a strong set of FY results, on August 31 2017, AIM listed Victoria updated on trading, and the board confirmed it had continued to make “good progress” in its key UK, European and Australian markets, and was on track to meet “all objectives” for the current financial year. “In addition to organic growth, the group continues to work on further acquisitions – in particular in Europe – and there is no shortage of high quality opportunities,” the board said in its statement. “With a strong platform for growth in place the board continues to remain confident for the future and committed to delivering returns for shareholders.” Interim results are scheduled for November 2017. 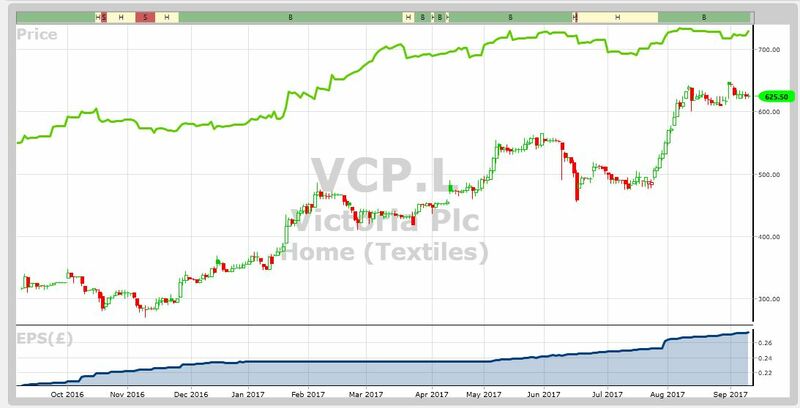 VectorVest first reported on the potential at VCP in Sept 2016, and then again on April 5 2017, where we noted strong earnings growth and generally unfulfilled potential. In April we flagged a value of 689p, and although the stock dipped briefly in line with market after that, it bounced back strongly to record a year high of 647p following the results. Despite this performance, the GRT – Earnings Growth Rate, (reflecting one to three year forecasted earnings growth in percent per year) still records a rate of 28% for VCP, which VectorVest considers to be excellent. Added to this the RT (Relative Safety) metric, which in April only rated VCP as fair, has dramatically improved, with a rating of 1.37, which is very good on a scale of 0.00 to 2.00. Finally VCP’s valuation has increased to 729p, which means at the current 625.50p per share, the stock is once again undervalued. The chart of VCP is shown above using my normal notation showing clearly a strong bull trend of rising price bottoms over the past year. The resilience shown in the face of a very negative few days trading on the overall market from the 4th to the 8thSeptember is also a bullish sign. Of note is the fact that in the last pullback, in the first weeks of August 2017, the share refused to go back and kiss the last major old high. This is the definition of a strong trend as defined by Charles Dow over 100 years ago. The trend looks set to continue as the overall market hopefully shrugs off its summer sleep. Summary: Groundhog day for VCP? As we once again look at this quality company, we can see how the criteria identified by the VectorVest stock analysis and portfolio management system this time last year has materialised into a solid year of growth and a doubling in the share price. 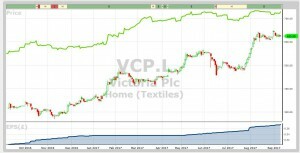 We fully expect this to continue, as the excellent visibility provided in the August trading statement and bullish charting signals indicate the VCP growth story is set to continue. Readers can examine trading opportunities on VCP and a host of other similar stocks for a single payment of £5.95. This gives access to the VectorVest Risk Free 5-week trial, where members enjoy unlimited access to VectorVest UK & U.S., plus VectorVest University for on-demand strategies and training. Link here to view.